The M26 in Kent is being shut overnight while work is done to see if it can be used as a “parking lot” for lorries, in the event of a no-deal Brexit. Tory MP Tom Tugendhat questioned why work began with “no consultation” – despite assurances none was planned. He has warned the work would “create chaos” in the surrounding area. Transport Secretary Chris Grayling confirmed the work was part of “no-deal” contingency planning but said he thought it would not be needed. The M26 will be closed overnight, from 2200 BST until 0530 BST until 15 October and again between 19 November and 21 December. 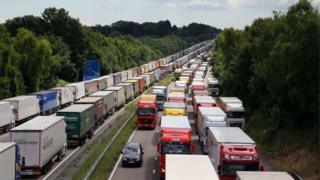 Sections of the M20 in Kent can be closed under Operation Stack, when lorries are forced to queue because of disruption to rail or ferry journeys. And there have been concerns that a no-deal Brexit could mean lorries getting stuck at the nearby port of Dover because of customs delays. What do Brexit ‘no-deal’ papers reveal? Mr Tugendhat, MP for Tonbridge and Malling, which covers the eastern half of the 10-mile long M26, told the Commons he had been assured that works were not planned as recently as last week – only to find out on Wednesday night that they were going ahead. He told MPs: “It’s come to a pretty pass when a member finds out that works have begun on a motorway to turn that motorway into a parking lot without consultation either with the local community or with surrounding members. “The M26 works started last night. I wrote (to Mr Grayling) in April, asking whether or not this would happen. A spokesman for Highways England said: “As part of wider resilience planning, Highways England has been asked by the Department for Transport to develop plans to utilise the M26 to hold heavy goods vehicles, should further capacity be required in the future. Operation Stack is currently used on closed sections of the M20 in Kent, where lorries park while waiting to cross the English Channel when traffic is disrupted. A new strategy, Operation Brock, due to start in early 2019, plans to use a contraflow to keep the roads open when problems arise.